American Lounge is an established English conversation school operating in the city of Yokohama, Japan. Yokohama, the second largest city in Japan, is located in the Kanto district, which is Japan’s financial and manufacturing center. A great deal of international business is conducted in the Kanto district. As a result, it is very important to members of many professions, in the area, to continually improve their use of English as a second language. Additionally, it is hoped by many Japanese people that succeeding generations of Japanese youths will become increasingly skillful at using English in all forms. It is for these reasons that American Lounge attracts a broad range of clients such as engineers, salespeople and business professionals as well as university, high school, junior high school, and even elementary students. ·	There are usually never more than four clients in a class. ·	The materials used in class are varied to coincide with the unique, goals and level of each client. Lessons therefore vary in focus. 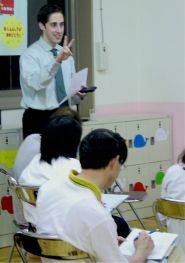 Lessons may consist of grammar review/instruction, article analysis, TOEIC preparation, EIKEN preparation, role-plays, pronunciation training, communication games, etc. A unique concept of American Lounge is the “lounge.” The lounge consists of couches and tables that create an informal atmosphere. Clients that sit in the lounge have the opportunity to apply the points they learn in their lessons by talking to native-speakers in an unstructured environment. The lounge creates a very relaxing atmosphere and fosters good rapport between American Lounge clients and staff members. American Lounge website is at www.americanlounge.net. Currently it is available only in Japanese.